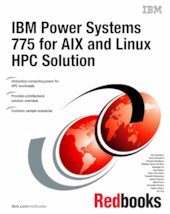 This IBM® Redbooks® publication contains information about the IBM Power Systems™ 775 Supercomputer solution for AIX® and Linux HPC customers. This publication provides details about how to plan, configure, maintain, and run HPC workloads in this environment. This IBM Redbooks document is targeted to current and future users of the IBM Power Systems 775 Supercomputer (consultants, IT architects, support staff, and IT specialists) responsible for delivering and implementing IBM Power Systems 775 clustering solutions for their enterprise high-performance computing applications.